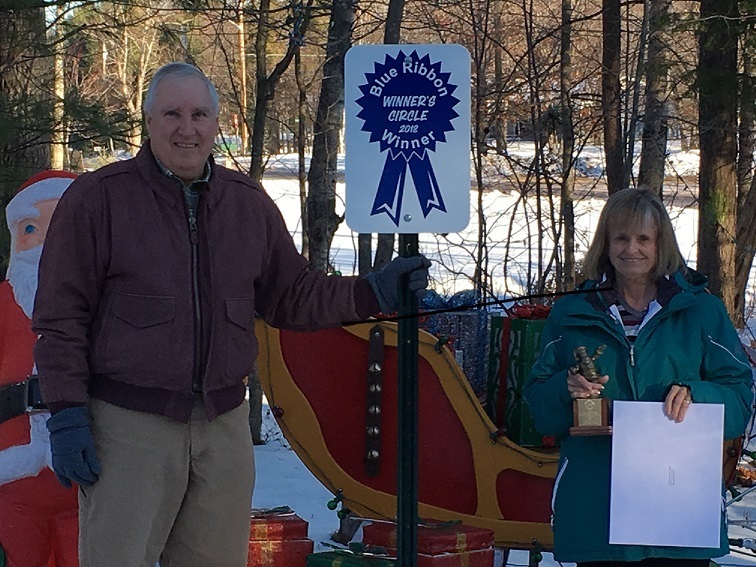 We have completed the judging of the 36th Annual MBLP Lighting Contest. For the winner's list click 2018 Winners List and for a driving guide, click Customer Driving Guide 2018. There are some unbelievable lighting displays out there so pack up the car and enjoy the "Christmas Cards to the Community!" Dan and Katie joined the contest this year and really hit it out of the park. It is an unbelievable large display for a first year entry. All we could say when we drove up was "WOW"! I can't wait to see what they do next year! They took 1st Place in Rudolph’s Rookies. Check it out at 495 Brookton Road, Marquette. Debbie Leiviska did another beautiful job this year. Definitely worth the drive to 35 Forest Drive in Negaunee Township. She uses mostly white lights in her display with just a splatter of red in just the right places. Her Christimas Tree with all white lights and large red ornaments is very tastefully done. The judges were “wowed” by the simple yet charming display. With Debbie's eye for detail, she has created a magical display. First Place in Frosty’s Favorites. Rich and Valerie Neault at 801 Silver Creek Road have done it again! 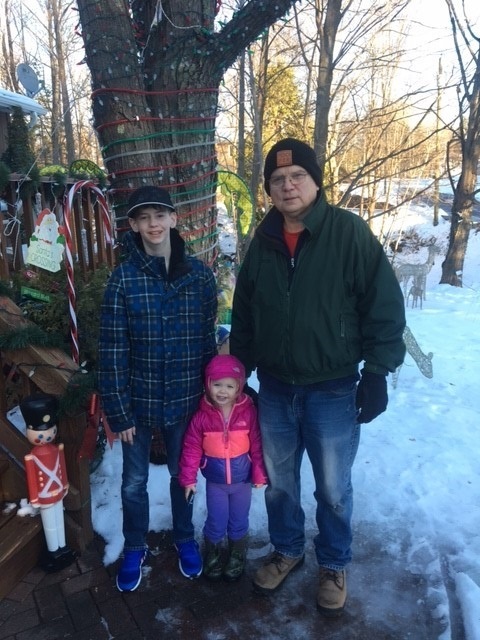 They have been working hard over the last seven years to create this wonderful ‘winter wonderland walk-through display.” The forethought and careful planning of their display is evident everywhere. Valerie said that she sees her yard as a blank slate and then puts her design together each year. She has so many, really great ideas. They have it perfectly laid out and have some really, unique decorations, like the antique sleight with lighted packages, the Ferris wheel (they drove over 500 miles to buy), titter tatter and the awesome nativity scene. This year, they have expanded even more. They have begun to fill their back yard too. It is truly amazing. You absolutely have to walk around the yard or you will miss so much. Valarie said that they spent 115 hours on the display this year. Can you just imagine spending all that time, thought and energy creating a lighting display for your neighbors? She said that sometimes her poor husband has to move things three or four times before it is just right. But they love creating this Giant Christmas Card for their friends and neighbors. 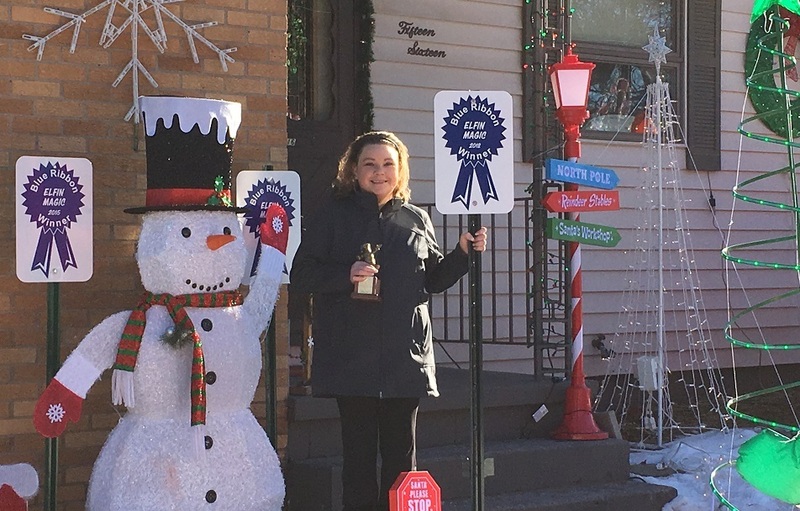 Valerie encourages people to stop, park and walk through the Candy Cane Lane so you can see all the decorations. Believe me, you won’t be disappointed. It’s all in the details and the Neault’s have it down to a ‘T’. First Place in the Winner’s Circle. 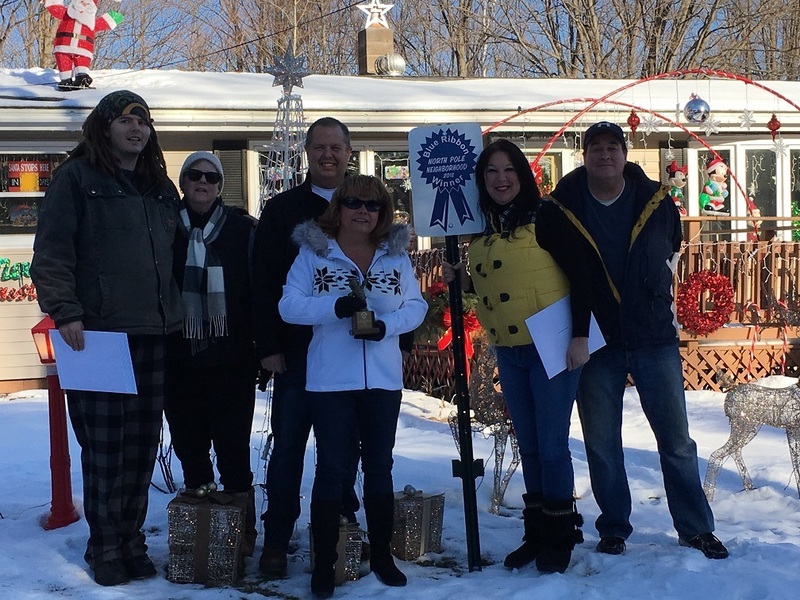 For the last four years, (l-r) Matt & Claudette Pryer, Janet Cobb & Tom Dagenais and Janeen & Kyle L’Huillier have been creating an amazing North Pole Neighborhood at 938, 1000 and 1002 Wilson Street. 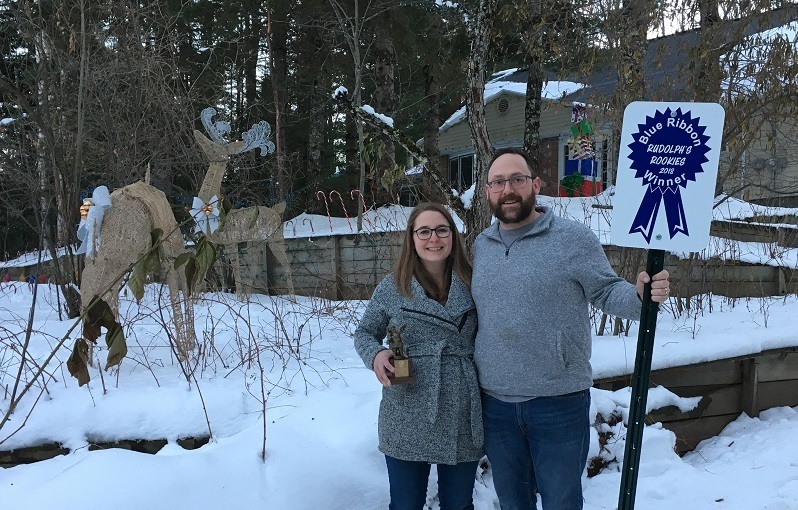 They call themselves “The Griswold’s of Wilson Street” and if you are having a hard time finding your Christmas spirit this season then you should definitely visit this display, your “bah humbugs” will instantly be gone. The three displays have such a great flow, it’s hard to see where one yard ends and the next begins. Make sure you roll down the windows to hear the Christmas music and don’t miss the woodsy fire glowing in the night in front of the garage, deer drinking from the little river and Santa looking out of the window? Their display is very creative and nicely done and gets bigger every year. 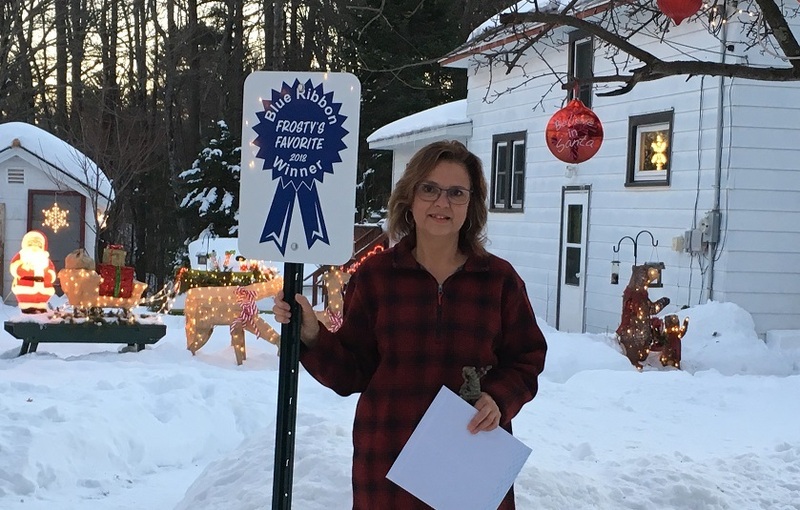 First Place in North Pole Neighborhood.